Author Shannon Hale and Bloomsbury book just released the trailer for Palace of Stone, the sequel to Princess Academy coming Agust 21, 2012. We are so excited! Coming down from the mountain to a new life in the city seems a thrill beyond imagining. When Miri and her friends from Mount Eskel set off to help the future princess Britta prepare for her royal wedding, she is happy about her chance to attend school in the capital city. There, Miri befriends students who seem so sophisticated and exciting . . . until she learns that they have some frightening plans. They think that Miri will help them, that she should help them. Soon Miri finds herself torn between loyalty to the princess and her new friends’ ideas, between an old love and a new crush, and between her small mountain home and the bustling city. Picking up where Princess Academy left off, this incredible stand-alone story celebrates the joys of friendship, the delight of romance, and the fate of a beloved fairy tale kingdom. Summary from Goodreads: Princess Emeralda a.ka. Emma isn’t exactly an ideal princess. Her laugh is more like a donkey’s bray than tinkling bells, she trips over her own feet and she does not like Prince Jorge, whom her mother hopes she will marry. But if Emma ever thought to escape her troubles, she never expected it to happen by turning into a frog! When convinced to kiss a frog so he might return to being a prince, somehow the spell is reversed and Emma turns into a frog herself! Thus begins their adventure–a quest to return to human form. Fascinating and hilarious characters ranging from a self-conscious but friendly bat to a surprisingly loyal snake and a wise green witch confirm that readers won’t soon forget this madcap story. A fantastic debut from the talented E.D. Baker. Cathy’s Review: Princess Emeralda (Emma) is getting pretty tired of castle-life. She is always less ladylike than her mother would have her be. Not to mention that her mother wants to marry her off to the horrible Prince Jorge. One day as she’s walking in her favorite place, the swamp, she comes across a talking frog. The frog tells her that he’s Prince Eadric and asks that she kiss him to reverse the spell that was cast on him by a witch. She’s not quite sure that she believes him, after all, who’s ever heard of talking frogs! 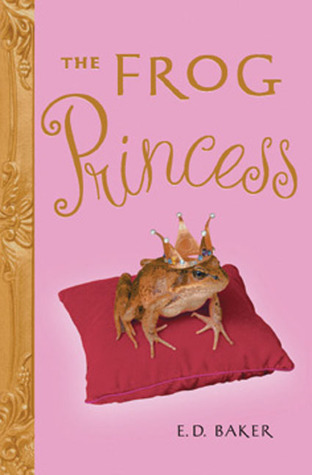 Emma goes to her aunt, Grassina the Green Witch, to see if it’s even a possibility that the frog could be a prince. Grassina seems preoccupied, but does confirm to Emma that people get turned into frogs, and Grassina herself has turned several people into frogs. Emma goes back to the swamp to find the frog, and decides that she will kiss him, but when she does something crazy happens. Emma turns into a frog as well. Unsure just what to do as a frog, Emma follows Eadric’s lead and learns all about being a frog, things like eating bugs, jumping, swimming and most importantly staying out of the way of animals that like to eat frogs! But just how will Emma be able to become human again, is it even possible?? This was a fun fairy-tale like book. I loved Emma, she was flawed enough that you could tell she wasn’t an everyday type of princess. I liked her aunt Grassina and I loved the way the book ended with a happy ending for both Emma and Grassina. I will make sure to look for the other books in this series! Upon a Curse continue the Frog Princess series. A mother of three, Ms Baker has had many interesting jobs: teacher, parrot caretaker at a garden centre, and currently, as a member of the Red Cross disaster Team, but her true love is writing. She lives in Maryland, USA, where she provides a home for two horses, one dog, three cats, one cockatiel and a bunny.